Ive put this video together for Madeleine. No information bar who she is and where she went missing. These are the nicest photos I could find of her on the web. That was lovely and her parents should take notes on how to show the world respect for your child. They digust me and I can't even look at their new appeal video/picture anymore. Thank you again for showing the world what is really at stake here and that is a small and innocent litle girl who was dealt the worst hand in the world when getting these people as parents. ETA, that picture at 2:10 reminds me so much of another sad abuse case here in the states, Lisa Steinberg. It was in the late 80"s and when she came to school for her school pictures one day; she was covered in bruises. Instead of reporting it and getting her help; the teacher and photographer covered her bruises with make up....unbelievable. Her story also involved seedy professionals with her fake adoptive dad being a lawyer who handled adoptions. He decided to adopt her and didn't tell the birth mom the truth. She never knew he had her until he made his last and final attack on that baby. Forcing her to drink hot sauce w/out water and beating her to death and hold on...went to dinner while she lay dying on bathroom floor. True story; and many laws were changed in her name but sadly for her and her birth mom life was over. Her mom to this day was never able to have more children and is still in therapy over her guilt. Very sad case. But my point being he was a professional (using word loosely) and he was quite fine with going to dinner knowing that 6 year was dying on his bathroom floor. He played the part wonderfully too. Went on for 8 years. For two years before he got Lisa, his live in girlfriend was his punching bag and worst, then once Lisa was there he started on her at 9mos old. The GF was so happy to be getting a break from beatings she didn't protect Lisa either. Disgusting. * I wrote a paper on this case in school and it was disturbing on so many levels b/c everyone thought he was this great lawyer finding kids homes. Anyways, thanks again for the beautiful video for Maddie. omg thats beauriful and i love that song by michael jackson that was written about a boy that died of aids just beautiful!!! Plainly dedicated to Madeleine, just 3 years of age when going missing. Narcissist McCanns should pay attention! malena stool wrote: Beautiful Antoinette. Well said, malena. As far as Kate and Gerry are concerned, they are the stars of this show. Gerry said that Maddie should tell people that her parents are Kate and Gerry McCann, rather than give her name. That says it all. It's not about Maddie for them. It's about them as celebs, thinking they are more important than their missing child. oh lovely but how sad! Love the song - MJ gone to soon as well. Karen wrote: oh lovely but how sad! skater58 wrote: That was lovely and her parents should take notes on how to show the world respect for your child. They digust me and I can't even look at their new appeal video/picture anymore. imo the video they put out was all about them...as usual..not about maddie.........yes tell them who your mummy and daddy are....was that to the abductor...like..as that is how it sounded.. Very lovely Antoinette and this is what should have been put out there instead of that video the MCs put out. Did nothing for Madeleine at all and if anyone passed her in the street, they would not think anything familiar about the child. Those pictures made me weep and I am not a weepie emotional person ! Thankyou for compiling it Antoinette . 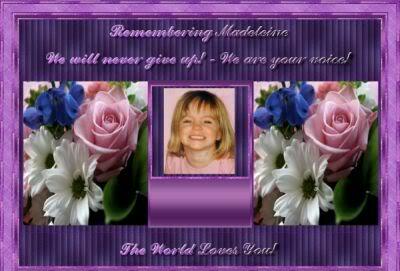 By the way folks I have been told by a pro McCann to stop saying Justice For Madeleine as she is not my child . What do you think of that ? Blueeyes wrote: Those pictures made me weep and I am not a weepie emotional person ! Thankyou for compiling it Antoinette . dont worry about them blueeyes i dont eve worry about them anymore none of them want justice for maddie they only care about gerry and kate!!!! What do I think of it? Not much! That implies that we shouldn't ever speak out for anyone who is not a member of our immediate family. We shouldn't ever be asking questions and supporting people who appear to be wrongly convicted of crimes, people whose children are missing, children who have been abused, children who have been taken into care with no evidence of abuse etc etc. If we and people on similar forums don't speak out for Maddie, who will? When I ignore an injustice that I am aware of, then I am colluding with it. If not me, then who? If not now, then when? I agree , but you cannot get past these blinkered people? I wonder if they have blind faith in everything they're spun ? Well done Antoinette.Beautifully put together and great song choice. lubelle wrote: Well done Antoinette.Beautifully put together and great song choice. The Song choice was Annaesse's so thanks to Annaesse too. As you all have said this is about Madeleine a beautiful 3 year old child who disappeared off the face of the earth. we may all not have known her but through her disappearance she has brought us all together. She is the victim in alll this no one else. Be she alive or dead she needs to be found and justice be served for those responsible for her disappearance.